Portadown manager Matthew Tipton. Photo by Tony Hendron. 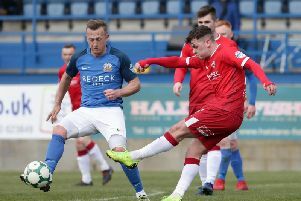 Portadown’s Bluefin Sport Championship promotion push gained another boost as home success over Harland and Wolff Welders by 3-1 confirmed a pre-play-off meeting with Carrick Rangers for the chance to tackle the top flight’s second-bottom side. Kevin Braniff produced two first-half assists as Portadown claimed control over a Welders side under the recently-appointed management team of George O’Boyle and Colin McIlwaine. Paul Finnegan proved alert at the back to deal with early Welders questions but the Ports broke the deadlock on 12 minutes. Liam McKenna’s corner-kick from the right was headed out by a Welders player and Braniff’s subsequent corner-kick from the left was headed in by Sean Mackle. Mackle then fired wide from a promising position off Aaron Duke’s lay-off as Portadown pushed on in a bid to build on the advantage. A golden opportunity arrived for an unmarked Adam McCallum central inside the penalty area but his header off Braniff’s curling free-kick delivery ended up in the arms of Matthew Anderson. Matthew Ferguson’s header in the home penalty area lacked the power to trouble Declan Dunne as Portadown dominated possession and restricted the Welders threat despite lacking a cutting edge. However, that upper hand resulted in a second reward in the final seconds of the first half. In similar circumstances to McCallum’s previous effort off a Braniff free-kick, the centre-back managed to convert on this occasion with a decisive flick. Portadown came close to number three around the hour mark as Ryan Carmichael attacked along the right and whipped a low ball across the face of goal but it proved just beyond Chris Lavery. Duke then dragged a shot wide of the upright as Portadown increased the pressure. However, the Welders grabbed the game’s next goal when Charlie Dornan drilled a shot home from the edge of the box inside Dunne’s right-hand upright. The Ports, with history of struggling to protect leads this season, appeared set up for another uncomfortable closing stage. But substitute Lavery capped the win on 90 minutes by picking up possession - off Andy Kilmartin’s pass - with time and space to fire home from distance. PORTADOWN: Dunne, McCallum, Finnegan, Braniff, Duke, Hall, Bradley (Lavery, 46), Wilson (Kilmartin, 81), Carmichael, Mackle, McKenna. Subs (not used): Carson, Larkin, Salley. HARLAND AND WOLFF WELDERS: Anderson, McMurty, Armstrong, McMillan, Spence (Rainey, 60), Deans, Graham (Morrow, 72), Dornan, Ferguson, O’Mahony (Arthurs, 77), Gardiner.